The 56th Bilderberg Meeting, an annual conference of influential politicians and businessmen, began Thursday in Chantilly, Virgina, according to a press release from the organization. The Conference will end Sunday and deals mainly with a nuclear free world, cyber terrorism, Africa, Russia, finance, protectionism, US-EU relations, Afghanistan and Pakistan, Islam and Iran. According to the press release, the meeting is private in order to encourage frank and open discussion. About 140 participants will attend, of whom about two-thirds come from Europe and the balance from North America. About one-third is from government and politics, and two-thirds are from finance, industry, labor, education and communications. An official list of the attendees can be found at Alex Jones' Infowars. Although it is an international forum, many prominent American officials and politicians attend the conference, including Secretary of State Condoleeza Rice, Chairman of the Federal Reserve Ben Bernanke and Paul Wolfowitz. James Johnson, the man tasked with selecting Barack Obama's running mate, is also on the list to attend the conference. InfoWars also reported that Senator Barack Obama’s office has refused to deny that the Democratic nominee attended Bilderberg last night following reports that he and Hillary Clinton were present at "an event in Northern Virginia." Obama spokesman Robert Gibbs would not say where the former rivals met, except that it was not at Clinton's home in Washington, reported the Associated Press. "Reporters traveling with Obama sensed something might be happening between the pair when they arrived at Dulles International Airport after an event in Northern Virginia and Obama was not aboard the airplane," the Associated Press reported. 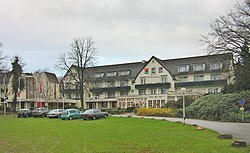 Bilderberg takes its name from the hotel in Holland, pictured above, where the first meeting took place in May 1954. That meeting grew out of the concern expressed by leading citizens on both sides of the Atlantic that Western Europe and North America were not working together as closely as they should on common problems of critical importance, according to the group's press release. The organization has sometimes drawn speculation that it forms a "shadowy global government," the BBC reported. Coverage of the Bilberberg conference can be found at Infowars. The Cold War has now ended. But in practically all respects, there are more, not fewer, common problems - from trade to jobs, from monetary policy to investment, from ecological challenges to the task of promoting international security. It is hard to think of any major issue in either Europe or North America whose unilateral solution would not have repercussions for the other. Thus the concept of a European-American forum has not been overtaken by time. The dialogue between these two regions is still - even increasingly - critical. What is unique about Bilderberg as a forum, is the broad cross-section of leading citizens that are assembled for nearly three days of informal and off-the-record discussion about topics of current concern especially in the fields of foreign affairs and the international economy; the strong feeling among participants that in view of the differing attitudes and experiences of the Western nations, there remains a clear need to further develop an understanding in which these concerns can be accommodated; the privacy of the meetings, which has no purpose other than to allow participants to speak their minds openly and freely. In short, Bilderberg is a small, flexible, informal and off-the-record international forum in which different viewpoints can be expressed and mutual understanding enhanced. Bilderberg's only activity is its annual Conference. At the meetings, no resolutions are proposed, no votes taken, and no policy statements issued. Since 1954, fifty-five conferences have been held. The names of the participants are made available to the press. Participants are chosen for their experience, their knowledge, and their standing; all participants attend Bilderberg in a private and not an official capacity.